Try as we might — dictionary searches, Google deep dives, database scouring of scholarly abstracts — we could not find a term to describe an animal who dislikes other animals of her species — sort of a wildlife version of a human-hating misanthrope. Whatever the word, Buttons, the beloved elk of our sage-covered high plains who embraced humans and spurned her own kind, seems to qualify. This 570-pound ungulate loved to nuzzle up to bipeds, especially those bearing food, yet appeared utterly uninterested in her herd. Around her own kind, she was the enigmatic loner, the recluse, Marlene Dietrich with a tawny coat. Happy endings, in the animal kingdom, are rare for human-loving specimens such as Buttons, who often find their affinity for people leads to an early demise via hunter’s scope, an automobile’s grill, or illness caused by a diet devoid of grasses and native shrubs. That’s why we were heartened last month when state Department of Fish and Wildlife workers removed Buttons from people’s backyards in Cle Elum and relocated her to the Wenas Valley, where she might rejoin the herd. We hoped that Buttons would find her tribe and make a seamless transition back, living out the remains of her days frolicking amid cacophonous hoofbeats and maybe losing a few pounds without all the sweets people fed her. Alas, Buttons was just too habituated to humans. She rejected the herd — or, who’s to say, maybe the herd rejected her, as well — and there she was, back to seeking out human companionship (and victuals), her sightings eliciting a collective “ahhh” on social-media platforms. 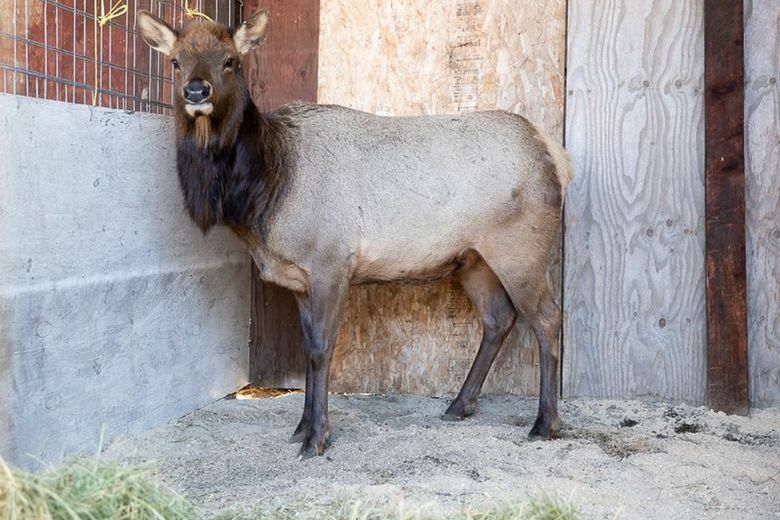 At that point, DFW officials wisely intervened and found a new “home” for Buttons at a Woodland Park Zoo exhibit in Seattle featuring other elk in captivity. So, yes, in a month or so, friends of Buttons can make the trek to Seattle for a visit and feed her carrots to their heart’s content. But this is not the way this storybook was meant to end — unless it was written by the Brothers Grimm — with Buttons locked in an enclosed space 24/7. This cow will never lead a normal life, normal as dictated by the natural order of things. It could have been worse, of course, much worse: premature death for this the Lone Elk — too trusting, too exposed to predators both human and animal. If there’s anything good that came out of the Buttons saga, it’s a heightened awareness that people should avoid interaction with wildlife, lest the animals lose their fear of humans and become, like Buttons, dependent on the kindness of strangers. The DFW and nonprofit wildlife organizations agree that it’s unhealthy for animals and dangerous for humans to feed animals. As the Humane Society Wildlife Land Trust warns, human-habituated animals “can cause injuries or spread disease … These unnatural conditions … can increase the spread of diseases, some of which may be transmitted to pets and humans.” Studies also show that too much food from an “artificial source” leads to overpopulation and other kinds of unintended consequences. Even incidental contact with humans can alter members of a species. In a 2012 study, researchers in Colorado and Alberta, Canada, found that wildlife get stressed and “more vigilant” around people hiking or in cars, “resulting in decreased forage intake and reduced reproductive success.” Elk near roads with vehicle traffic, the study found, became even more vigilant — i.e., anxious — than when threatened by predators. Buttons, though, was not like other elk. She was compliant, not skittish, around humans. It could well be that it was the herd that rejected Buttons upon re-entry, not the other way around. Her saga brings to mind the tragic incident at Yellowstone Park in 2016, when an interaction between well-intentioned park visitors and a baby bison had much sadder ending. Two tourists found a bison calf standing in the middle of a road in the park and, thinking the calf was lost, ignored signage telling visitors to stay clear of all animals. The two loaded the bison into their SUV and drove it to a ranger station because they thought the bison was “cold.” Rangers cited the tourists ($100 fine) and returned the baby bison to the spot where it was picked up and made numerous attempts to reunite it. But the calf was rejected by the herd and later had to be euthanized. Fortunately, the worst thing that happened to Buttons after her extended Air BnB-like encounter with humans was that she gained 75 pounds. Woodland Park zoo officials vow to return Buttons to an appropriate weight and try to get her to interact with other captive elk. Don’t be surprised, though, if she perks up only when humans come to visit.